Trisomy 21, also known as Down syndrome, is a disease caused by an abnormality in the chromosomes (the cellular structures that contain the genetic material of the body). 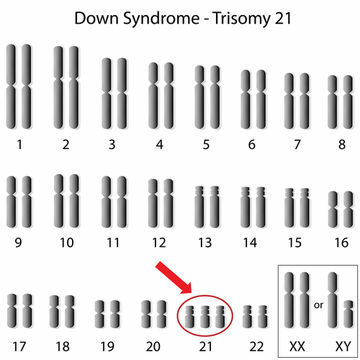 People with trisomy 21 have three chromosomes 21 instead of a single pair. This imbalance in the functioning of the genome (all of the hereditary information present in human cells) and the body causes permanent mental retardation and developmental delay. Trisomy 21 can vary in severity. The syndrome is becoming better known and early intervention can make a big difference in the quality of life of children and adults with the disease. In the vast majority of cases, this disease is not hereditary, that is, it is not transmitted from parents to their children. Down syndrome owes its name to the English physician John Langdon Down who published in 1866 the first description of people with trisomy 21. Before him, other French doctors had made the observation. As the affected people have characteristic traits of the Mongols, that is to say a small head, a rounded and flattened face of the slanted and spread-out eyes, this disease was commonly called “Mongoloid idiocy” or Mongolism. Today, this denomination is rather pejorative. In 1958, French physician Jerome Lejeune identifies the cause of Down syndrome namely, an extra chromosome on the 21 th chromosome pair. For the first time, the link is established between a mental retardation and a chromosomal anomaly. This discovery opened up new possibilities for the understanding and treatment of many genetic illnesses. Each human cell contains 46 chromosomes organized into 23 pairs on which genes are found. At the time of fertilization of an egg and a spermatozoon, each parent transmits to his child 23 chromosomes, in other words, half of his genetic background. Trisomy 21 is caused by the presence of a third chromosome 21, caused by an abnormality during cell division. Chromosome 21 is the smallest chromosome: it has about 300 genes. In 95% of trisomy 21 cases, this excess chromosome is found in all the cells of the body of the affected people. More rare forms of Down syndrome are caused by other abnormalities of cell division. Approximately 2% of people with Down syndrome have excess chromosomes in only a portion of the body’s cells. This is called trisomy 21 mosaic. In about 3% of people with Down syndrome, only part of chromosome 21 is overweight. This is trisomy 21 by translocation. In France, trisomy 21 is the leading cause of mental handicap of genetic origin. There are approximately 50,000 people with trisomy 21. This pathology would affect 1 birth in 700 to 1000. According to the Quebec Ministry of Health, Trisomy 21 affects about 1 baby out of 770 births. All women can have a child with trisomy 21 but the probability increases with age. 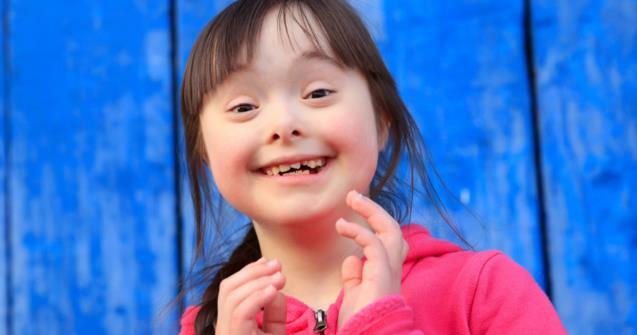 At age 20, a woman would have a risk of 1 in 1500 to have a child with Down syndrome. At age 30, the risk is 1 in 1000. This risk would increase from 1 in 100 to 40 years and 1 in 28 to 50 years. The diagnosis of Down syndrome is usually made after birth, at the sight of the baby’s features. However, to confirm the diagnosis, it is necessary to carry out a karyotype (= test which makes it possible to study chromosomes). A sample of the baby’s blood is taken to analyze the chromosomes in the cells. There are two types of prenatal tests that can diagnose trisomy 21 before birth. The screening tests, which are intended for all pregnant women, make it possible to evaluate whether the probability or the risk that the baby has trisomy 21 is low or high. This test consists of a blood sample and then the analysis of the nuchal translucency, that is to say the space between the skin of the neck and the spinal column of the fetus. This test is done during an ultrasound between 11 and 13 weeks of pregnancy . It is safe for the fetus. The diagnostic tests that target women whose risk is high, indicate whether the fetus has the disease. These tests are usually performed between 15 Th and 20 Th week of pregnancy . The accuracy of these techniques for screening for Down syndrome is approximately 98% to 99%. The test results are available in 2 or 3 weeks. Before taking any of these tests, pregnant women and their spouses are also advised to meet with a genetic consultant to discuss the risks and benefits associated with these procedures. The amniocentesis to determine with certainty whether the fetus has trisomy 21. This test is usually performed between the 15 Th and 22 Th week of pregnancy. An amniotic fluid sample from the uterus of the pregnant woman is made using a thin needle inserted into the abdomen. Amniocentesis carries some risk of complications, which can lead to the loss of the fetus (1 in 200 women is concerned). The test is offered primarily to women who are at high risk based on screening tests. The removal of chorionic villa. The removal (or biopsy) of chorionic villa (PVC) allows to determine if the fetus is carrying a chromosomal abnormality such as trisomy 21. The technique consists of removing placenta fragments called chorionic villa. Sampling is done through the abdomen or vaginally between the 11 Th and 13 Th week of pregnancy. This method carries a risk of miscarriage that amounts to 0.5 to 1%. The term trisomy refers to the fact that an entire chromosome or a chromosome fragment is represented in triplicate instead of two. Of the 23 pairs of chromosomes present in human cells, others may be completely or partially trisomized. However, more than 95% of affected fetuses die before being born or after only a few weeks of life. The trisomy 18 (Edwards or syndrome) is a chromosomal abnormality due to the presence of an extra chromosome 18. The incidence is estimated at 1 in 6000 to 8000 births. The trisomy 13 is a chromosomal abnormality due to the presence of an extra chromosome 13. It causes brain, organ and eye malformations, as well as deafness. Its incidence is estimated at 1 case in 8000 to 15000 births. The arrival in the family of a baby with trisomy 21 may require a period of adjustment. These children require special care and extra attention. Take the time to get to know your child and make a place for him in the family. Every child with Down syndrome has its own personality and needs as much love and support as others. Epicanthus (skin folds above the upper eyelid). Hypertrophy and protrusion of the tongue (the tongue is abnormally advanced forward). A little head and little ears. A single fold in the palms of the hand, called single transverse palmar folds. A smallness of the limbs and the trunk. Muscular hypotonia ( all muscles are soft) and abnormally soft joints (hyperlaxity). Slow growth and generally smaller size than children of the same age. In babies, a delay in learning such as turning, sitting and crawling due to low muscle tone. These learnings are generally double the age of children without trisomy. Heart defects . According to the Canadian Down Syndrome Society (SCSD), more than 40% of children with the syndrome have congenital heart defects present at birth. An intestinal obstruction (or blockage) requiring surgery. It concerns about 10% of newborns with trisomy 21. A susceptibility to infections such as pneumonia, due to decreased immunity. An increased risk of hypothyroidism (weak thyroid hormone), leukemia or convulsions. A language delay , sometimes aggravated by the loss of hearing. Of eye disorders and vision (cataracts, strabismus, myopia or hyperopia are more common). An increased risk of sleep apnea. In men with infertility. Pregnancy is however possible for most women. Affected adults are also more prone to the early form of Alzheimer’s disease. Being pregnant in old age a woman is more likely to give birth to a child with trisomy 21 as she gets older. Eggs produced by older women are more likely to cause abnormalities in the division of chromosomes. Thus, at age 35, the risk of conceiving a child with trisomy 21 is 1 in 400. At 45, they are 1 in 35. Have already given birth to a child with trisomy 21. A woman who gave birth to a child with trisomy 21 has a 1% risk of having another child affected. Be a carrier of the Down syndrome translocation gene. The majority of trisomy 21 cases result from a non-hereditary accident. However, a small percentage of cases have a familial risk factor for trisomy 21 (trisomy by translocation). Down syndrome is a disease that is better understood. Thanks to early management of medical problems associated with trisomy 21 such as heart defects, the quality and life expectancy of people with Down syndrome has greatly increased. Today, 80% of adults live to age 55, and some even longer. Many adults with Down syndrome are employed, live semi-autonomously and integrate better and better into community life. No treatment can improve the intellectual abilities of people with Down syndrome. However, early follow-up and good support by a team of professionals, throughout life, allows the maintenance of intellectual and physical abilities. Hypotonia and hyperlaxity can be improved by management in speech therapy that allows the improvement of language and communication and physiotherapy, exercise program adapted to muscle building, endurance and mobility. Dental diseases and feeding difficulties can be avoided by early management, including hygiene education and chewing training. People with Down syndrome are aware early on of their disability. Psychological counseling is sometimes necessary, especially during periods of change (for example, when siblings leave, a marriage, a death, or during social and professional integration situations). Psychological counseling is also important for family members accompanying the person with Down syndrome. Two lines of research are targeted by researchers working to find a treatment to improve intellectual disabilities due to trisomy 21, firstly by acting on the genes responsible for cognitive disorders and secondly by acting directly in the nervous system, particularly on neurotransmitters (substances that relay information to the brain such as acetylcholine, serotonin, dopamine, GABA, etc.). Several international research teams are involved in this research. People with Down Syndrome have an extra 21 chromosome, which means about 300 excess genes. Of these, only a few are involved in intellectual disability. In recent years, two genes have been identified: the gene for DYRK1A and the gene for CBS (cystathionine beta-synthase). Clinical trials are underway to discover molecules that would be able to inhibit the expression of these genes and thus affect the degree of intellectual disability of people with Down Syndrome. In people with Down syndrome, a neurotransmitter, GABA (gamma-aminobutyric acid) is too abundant and causes a slowdown in nerve activity. Since 2011, researchers have been testing the effectiveness of a molecule that could inhibit its action and improve the cognitive and behavioral deficits of people with Down Syndrome.